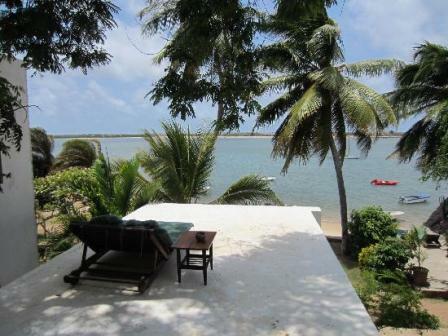 I found Mombasa Backpackers to be a restful place, with great people, and great management. And it is just a short 5 minute walk down to the beach, where there is great water sports to partake in. The food in the Backpackers was very tasty, with a lot of variety, including great Burgers and Mexican food. Great base if you want to explore the coastal strip, it is easily accessible to the beach, supermarket/ mall, park and movie theater(cinemax), and the town centre. Friendly and helpful staff will ensure a comfy stay, will summon you a taxi/ tuktuk, and will even do your laundry at an affordable fee. The first thing to say about this place is that it is insanely convenient to get to! It is a short walk (5 min)from the big Nakumatt supermarket (Kenya's largest chain so EVERY local knows it) on the main North/South coast road. The compound itself is tucked nicely out of the way on a smart residential street in the Mombasa suburb of Nyali. On arriving i was assisted by owner and host David, a charismatic Peruvian ex pat who has a great hands on approach to running the hostel which ensures it has a nice sharp professional feel to it. David is assisted by a a small locally employed staff who take care of the place. There is a wide variety of dorm rooms of differing bed numbers and a few private rooms. Bar: it was the most diverse and impressive selection of beer i've seen! pool: super clean, warm and a great asset... you can even do trial dives with the local diving company. Other: a book exchange / selection of games / take away menu's / taxi & transport connections with reputable safe local providers / links into a lot of cool other things to do like safaris rafting etc. Over all i reckon this place rocks... it's modeled on the better backpackers hostels I've stayed in over the years as a kayaking nomad. Its sharp where it needs to be, mellow where it should be, striking a professional balance unique in Kenya... stoked to have found you!